Not to be confused with Knight Rider or Night Rider. The Knight Ridder building in San Jose, California. Knight Ridder /ˈrɪdər/ (from Dutch: ridder, knight) was an American media company, specializing in newspaper and Internet publishing. Until it was bought by McClatchy on June 27, 2006, it was the second-largest newspaper publisher in the United States, with 32 daily newspapers sold. 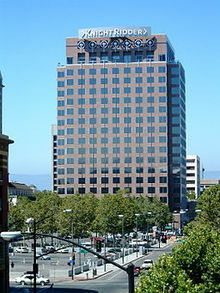 Its headquarters were located in San Jose, California. Both companies went public in 1969 and merged on July 11, 1974. For a brief time, the combined company was the largest newspaper publisher in the United States. Knight Ridder had a long history of innovation in technology. It was the first newspaper publisher to experiment with videotex when it launched its Viewtron system in 1983. After investing six years of research and $50 million into the service, Knight Ridder shut down Viewtron in 1986 when the service's interactivity features proved more popular than news delivery. Knight-Ridder purchased Dialog Information Services Inc. from Lockheed Corporation in August 1988. In October 1988, the company placed its eight broadcast television stations up for sale to reduce debt and to pay for the purchase of Dialog. In 1997 it bought four newspapers from The Walt Disney Company formerly owned by Capital Cities Communications after Disney's purchase of Cap Cities mainly for the ABC television network (The Kansas City Star, Fort Worth Star-Telegram, Belleville News-Democrat and (Wilkes-Barre) Times Leader for $1.65 billion. It was, at the time, the most expensive newspaper acquisition in history. For most of its existence, the company was based in Miami, with headquarters on the top floor of the Miami Herald building. In 1998, Knight Ridder relocated its headquarters from Miami to San Jose, Calif.; there, that city's Mercury News—the first daily newspaper to regularly publish its full content online—was booming along with the rest of Silicon Valley. The internet division had been established there three years earlier. The company rented several floors in a downtown high-rise as its new corporate base. In November 2005, the company announced plans for "strategic initiatives," which involved the possible sale of the company. This came after three major institutional shareholders publicly urged management to put the company up for sale. At the time, the company had a higher profit margin than many Fortune 500 companies, including ExxonMobil. In run-up to the 2003 invasion of Iraq, Knight Ridder DC Bureau reporters Jonathan Landay and Warren Strobel (both now working for Reuters) wrote a series of articles critical of purported intelligence suggesting links between Saddam Hussein, the obtainment of weapons of mass destruction, and Al-Qaeda, citing anonymous sources. Landay and Strobel's stories ran in counter to reports by The New York Times, The Washington Post and other national publications, resulting in some newspapers within Knight-Ridder chain refusing to run the two reporter's stories. After the war and the discrediting of many initial news reports, Strobel and Landay received the Raymond Clapper Memorial award from the Senate Press Gallery on February 5, 2004 for their coverage. The Huffington Post headlined the two as "the reporting team that got Iraq right". The Columbia Journalism Review described the reporting as "unequaled by the Bigfoots working at higher-visibility outlets such as the New York Times, the Washington Post, the Wall Street Journal and the Los Angeles Times". Later after the war, their work was featured in Bill Moyers' PBS documentary "Buying The War" and was dramatized in the 2017 film Shock and Awe. On March 13, 2006, The McClatchy Company announced its agreement to purchase Knight Ridder for a purchase price of $6.5 billion in cash, stock and debt. The deal gave McClatchy 32 daily newspapers in 29 markets, with a total circulation of 3.3 million. However, for various reasons, McClatchy decided immediately to resell twelve of these papers. On April 26, 2006, McClatchy announced it was selling the San Jose Mercury News, Contra Costa Times, Monterey Herald, and St. Paul Pioneer Press to MediaNews Group (with backing from the Hearst Corporation) for $1 billion. Vu/Text: 1982–1996. Merged with PressLink to become MediaStream. PressLink: ??–1996. Merged with Vu/Text to become MediaStream. Knight Ridder Financial Inc: 1985–1996. Acquired by Global Financial trading as Bridge Data. RealCities Network: 2004–2006. RealCities was a portal/hub website for Knight-Ridder group. It was absorbed with The McClatchy Company into McClatchy Interactive and sold to Chicago-based Centro in 2008. In 1954, Ridder Newspapers launched WDSM-TV in Superior, Wisconsin, serving the Duluth, Minnesota market. Initially a CBS affiliate, it switched to its present NBC affiliation a year and a half after the station's launch. It was spun off after Ridder's merger with Knight Newspapers, Inc.
From 1956 to 1962, Knight co-owned a then-NBC affiliate, WCKT in Miami, Florida, with the Cox publishing family. In 1977, Knight Ridder entered broadcasting with the acquisition of Poole Broadcasting, which consisted of WJRT-TV in Flint, Michigan, WTEN in Albany, New York and its satellite WCDC in Adams, Massachusetts, and WPRI-TV in Providence, Rhode Island. Immediately after the acquisition of these stations was finalized, Knight Ridder cut a corporate affiliation deal with ABC, switching then-CBS affiliates WTEN/WCDC and WPRI (the latter of which eventually rejoined CBS) to ABC (WJRT was already affiliated with ABC when the affiliation deal was made). Knight Ridder would acquire several television stations in medium-sized markets during the 1980s, including three stations owned by The Detroit News which the Gannett Company (which purchased the newspaper in 1986) could not keep due to Federal Communications Commission regulations on media cross-ownership and/or television duopolies then in effect. (None of Knight Ridder's later acquisitions changed their network affiliations under Knight Ridder ownership; for example, then-NBC affiliate WALA-TV in Mobile, Alabama remained an NBC affiliate when it was owned by Knight Ridder and would switch to Fox several years after Knight Ridder sold the station.) In early 1989, Knight Ridder announced its exit from broadcasting, selling all of its stations to separate buyers; the sales were finalized in the summer and early fall of that year. (**) - This station was co-owned by Knight Newspapers and Cox Newspapers, long before Knight's merger with Ridder Publications. (++) - This station was owned by Ridder Publications until the merger between Ridder and Knight forced its divestiture. (satellite of WTEN) 19 (36) 1978–1989 defunct; License cancelled in 2018. • Shock and Awe, 2018 film about a group of journalists at Knight Ridder's Washington Bureau who investigate the reasons behind the Bush Administration's 2003 invasion of Iraq. ^ "Viewtron Remembered Roundtable". Archived from the original on 2012-10-20. Retrieved 2012-10-19. ^ "Knight-Ridder Puts 8 TV Stations on Block to Reduce $929-Million Debt". Los Angeles Times. AP. October 4, 1988. Retrieved January 26, 2016. ^ Astor, David. "Iraq-Coverage Awards for KR, UPI – Editor & Publisher". Retrieved 2019-04-05. ^ Follmer, Max (2008-03-28). "The Reporting Team That Got Iraq Right". HuffPost. Retrieved 2019-04-05. ^ "Knight-Ridder Scores (Again)". Columbia Journalism Review. Retrieved 2019-04-05. ^ "Bill Moyers Journal . Buying the War . Watch the Show | PBS". www.pbs.org. Retrieved 2019-04-05. ^ "mcclatchy.com". Archived from the original on 2006-04-09. Retrieved 2006-04-11. ^ Seelye, Katharine Q.; Sorkin, Andrew Ross (2006-03-13). "Newspaper Chain Agrees to a Sale for $4.5 Billion". The New York Times. ISSN 0362-4331. Retrieved 2019-01-17. ^ "infotoday.com". infotoday.com. Retrieved 2018-04-09. ^ "RealCities Network". Archived from the original on 2012-08-13. Retrieved 2012-07-31. ^ "McClatchy Interactive". Archived from the original on 2012-08-03. Retrieved 2012-07-31. ^ "Centro". Centro. 2018-01-18. Retrieved 2018-04-09. Merritt, Davis (2005). Knightfall: Knight Ridder and How the Erosion of Newspaper Journalism Is Putting Democracy at Risk. New York: Amacom. ISBN 0814408540. Wikimedia Commons has media related to Knight Ridder. This page was last edited on 8 April 2019, at 05:17 (UTC).